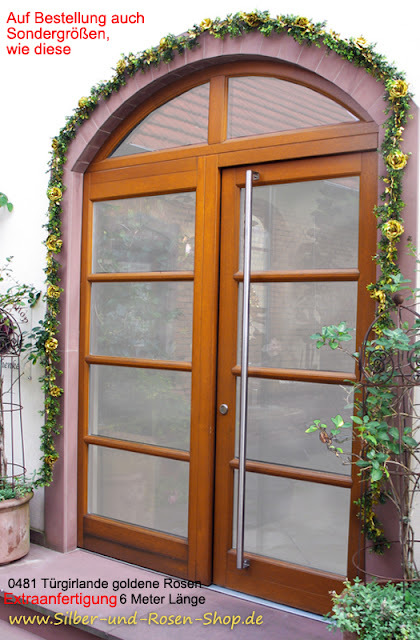 Laßt das Haus, kommt hinaus, windet einen Strauß! Die ersten Rose blüht in meinem Garten. Es ist der Rambler "Hiawatha", eine einfache purpurrote Kletterrose (Walsh 1904). The first rose blooms in my garden. Its the rambler "Hiawatha" (Walsh 1904), with plain blooms in crimson red . Let the house, out comes, binds a bouquet! Wusstet ihr, dass es sogar eine einfach blühende Mairose gibt? Sie ist abgebildet in dem schönen Rosenkalender von Thorbecke, den ich letztes Jahr geschenkt bekam. 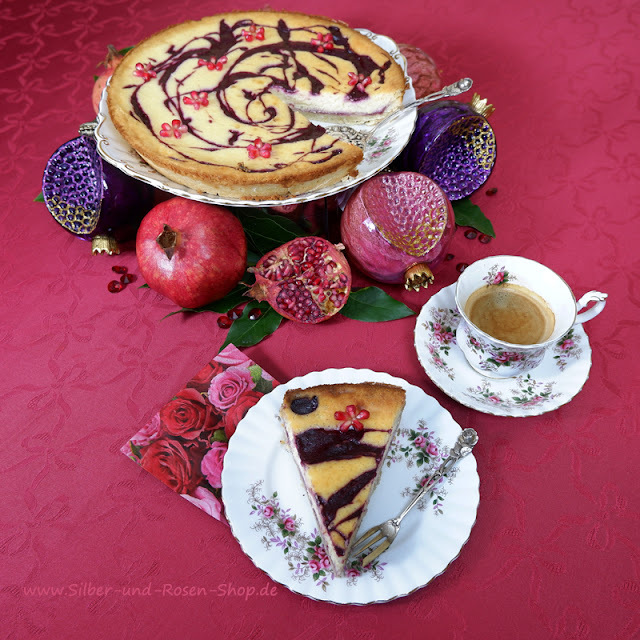 Rosa majalis ist einfachblühend mit zimtfarbenen Hagebutten. Did you know that there is even a May Rose? 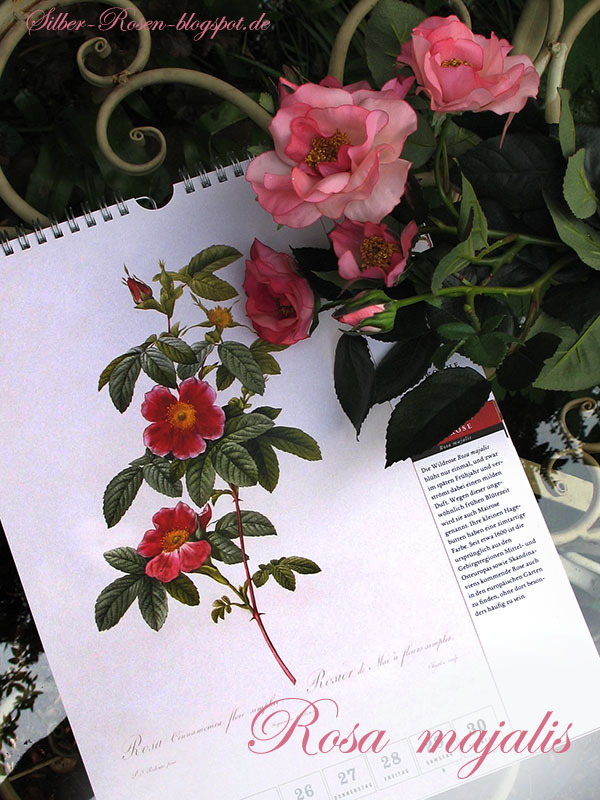 She is depicted in the beautiful Rose Calendar of Thorbecke, I was given last year. Rosa majalis is simply blooming with cinnamon colored rose hips. Wir durchzieh'n Saaten grün. Haine, die ergötzend blüh'n. Waldespracht - neu gemacht nach des Winters Nacht. Ich habe uns in der Waldecke den Teetisch gedeckt. Es gibt heute etwas ganz Besonderes. 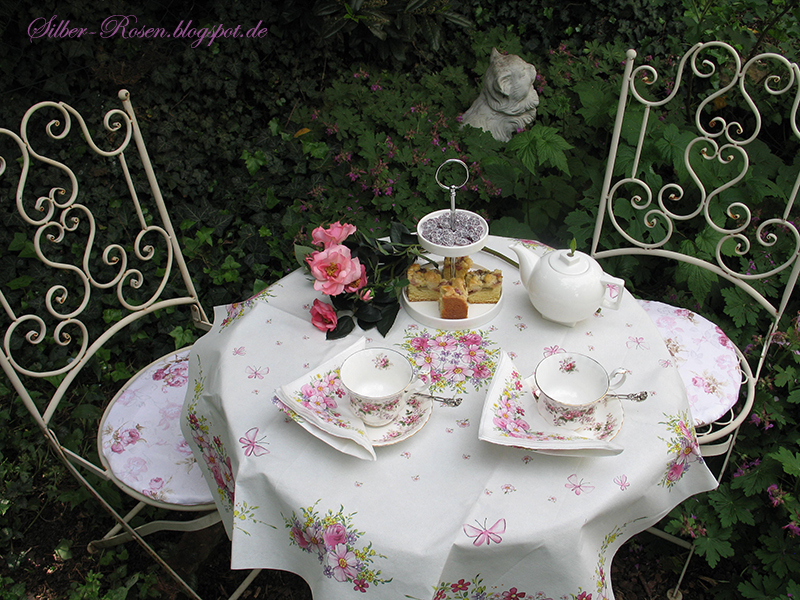 I have set the tea table for us in the forest-like corner of the garden. We will have something very special today. We run through green fields. Groves bloom pleasantly. Forest splendor - newly made, after the winter's darkness. There in the shadows the source, trickles merrily, silvery. Diese Veilchenbonbons sind das liebe Geschenk einer ganz bezaubernden jungen Dame. Sie sehen nicht nur niedlich aus, sondern haben eine umwerfenden süßen Veilchengeschmack. Ich vernasche die mit Bedacht und voller Genuss. This violet candies are the love gift of a very charming young lady. 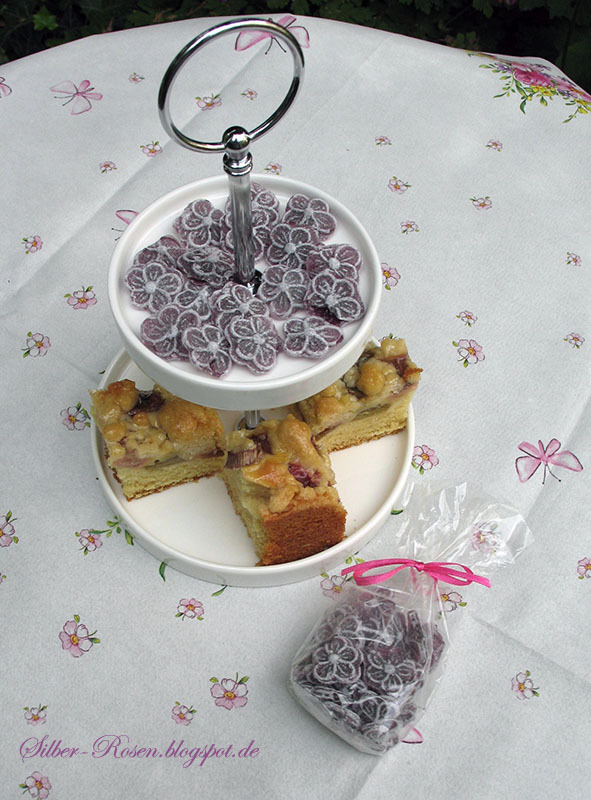 They not only look cute but have a stunning sweet violet flavor. I eat them deliberately and full of enjoyment. Alles freut sich der Zeit, die verjüngt, erneut. Widerschein der Schöpfung blüht, uns erneuernd im Gemüt. Alles neu, frisch und frei, macht der holde Mai. das ist weißer Tee mit Hibiskus, Brombeerblättern, Rhabarberstückchen und einem Hauch Zimt. Dazu die Veilchenbonbons und Rhabarberkuchen. 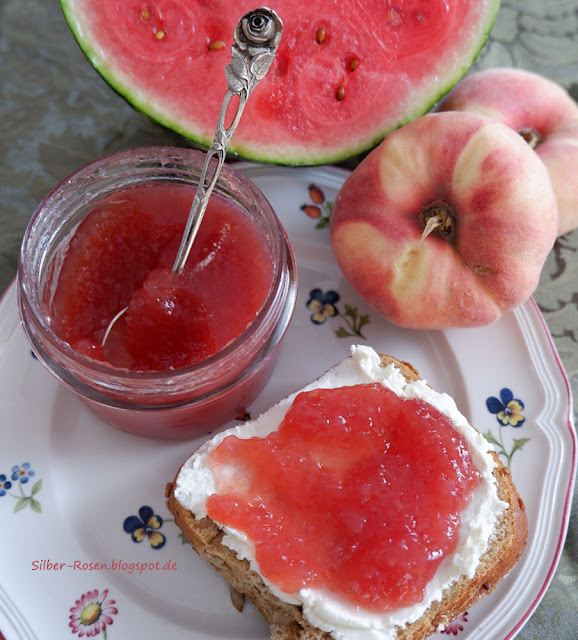 We will have today the Peach-Rhubarb-Preserve of Tea forté. It is white tea with hibiscus, blackberry leaves, rhubarb and a hint of cinnamon. For this, the violet candies and rhubarb pie. Here and there, on and on, where do we draw place by place. Everything is happy about this time, which rejuvenates and revives. Reflection of creation blooms, renewing us in the mind. Everything is new in May. Makes the soul fresh and free. Wieder solche schöne Bilder mit leckeren Tee und Kuchen + Veilchenbonbons! Die Mai Rose ist auch so schön, besonders die Farbe. I love the month of May. Everything is fresh and new which is why Hubby and I chose this month to be married. 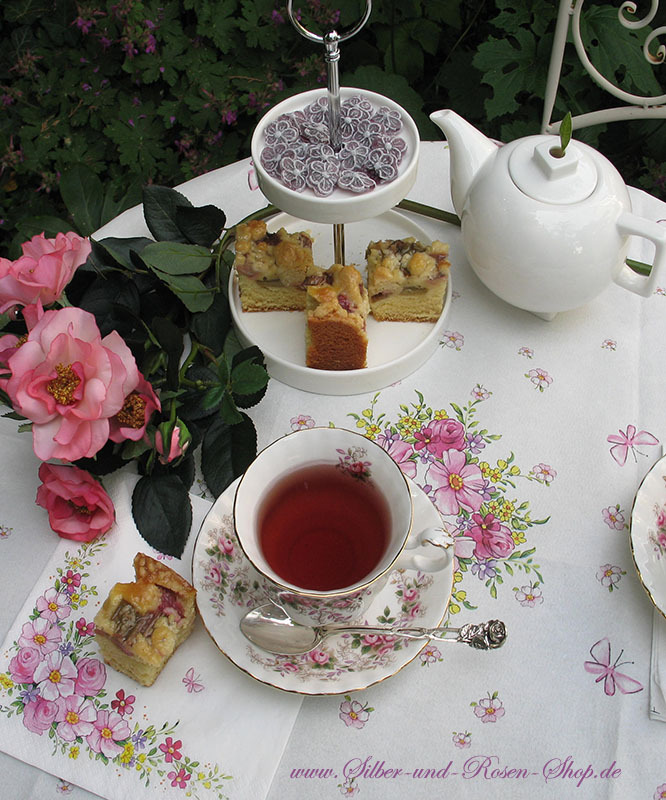 Your tea table is delightful among the vines and lovely greenery. The china is beautiful and the linens are lovely. I would love to sit and join you there at your pretty table. Thank you for joining me for Tea Time. Johanna, your roses are lovely and your tea setting is as pretty as ever. I'm not the Sarah who sent you the violet candies, but ironically I recently purchased a jar of these little sweets myself. They are delightful! Your attention to details is amazing. That table cloth and napkins are lovely as the whole setting just sparkles! Lovely china as well! Very lovely forest setting for your tea today. 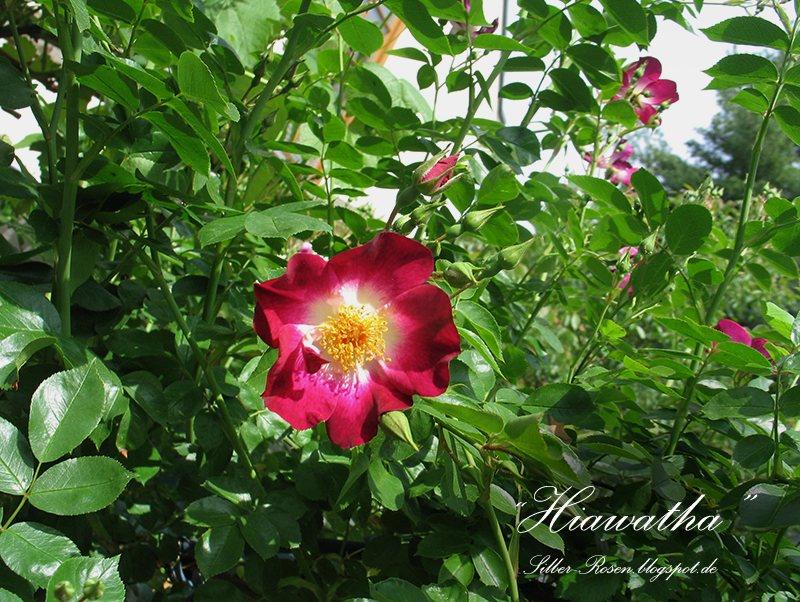 The new rose Hiawatha is stunning! What magnificent color! This must be a sight to cheer anyone. Your rise is beautiful and I love the rose calendar! How I love your tea time outdoors! Such a beautiful tablecloth and tea dishes! Your sweets look so good, too! Beautiful tea setting Johanna. And how pretty is that Rosa Majalis rose. The photo in the calendar is so life-like. There's a lolly shop half hour away from where I live, they sell different flavoured gummies that are made in Germany. I wonder why they don't sell that violet flavoured ones. Enjoy the best of warm weather.